This unique antique platinum wedding band is engraved with a repeating pattern of circles and pairs of diagonal lines. 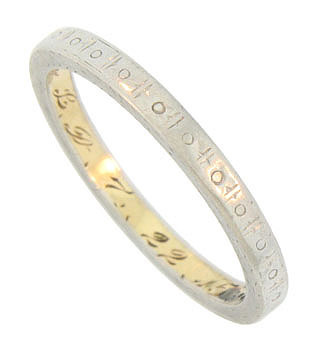 The inside of the band is finished in 14K yellow gold and inscribed "G.G to L.D. 7 - 22- 15". 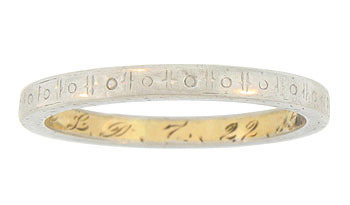 The Edwardian wedding ring measures 2.40 mm in width. Circa: 1915. Size 5 3/4. We cannot re-size.